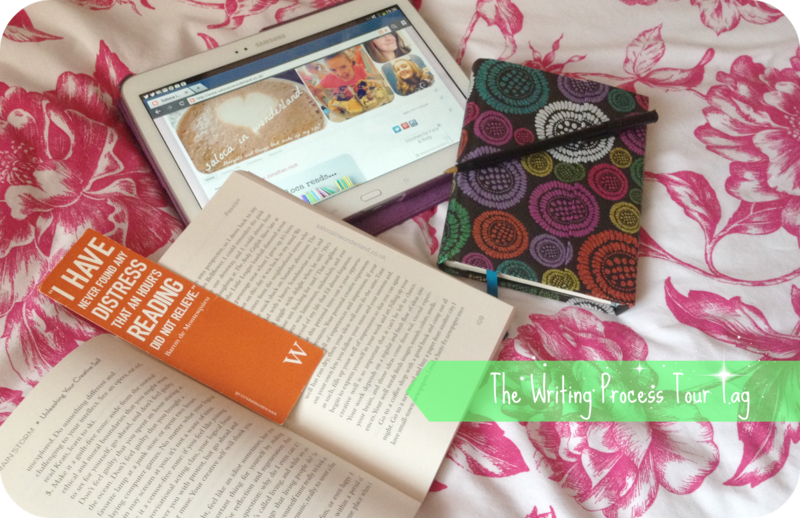 The lovely Corinne has tagged me in to do the writing process tour tag! You know me, I can’t pass up a good tag opportunity and seen as though I’m attempting to blog every day in September (I’m blaming Corinne for that too! ), I figured this tag has come at the perfect time when lots of writing is (or at least I hope is!) getting done! For those of you who don’t know, or haven’t read this post, I love writing. I actually studied creative writing at University as part of my degree, then stayed on to gain a very fancy pants Masters in writing studies. So yeah, me and writing, we’re pretty good buddies! I love to write about the actual writing process and could talk about writing for hours – though it’s only really my writing buddies who can put up with my ramblings on the subject for that long! So without further a do, let’s get on with the tag! Right now, most of my focus is on putting together a blog post for every day in September. I’ve only attempted this challenge a handful of times since I started blogging but I’m going into it, for the first time, feeling very confident! Usually my doubts start early on, but so far, so good! I’m actually enjoying writing more than ever right now! Outside of the blog I want to say I’m working on a novel of some sort. Now, don’t get me wrong, it’s not from lack of trying! It’s from a lack of time and inspiration! I’ve been delving deep into my old journals and reading lots of creativity inspiring books so who knows what might happen! You tell me! I have no idea! I guess my blog differs from other blogs in a similar category because mine is written by me? It’s my voice you’re reading right now – my voice is inside your head! I guess one thing I’ve noticed is that my reviews are usually far from short and sweet, I tend to maybe go into too much detail (or, let’s face it, all around the houses to get to a point) when a lot of the blog I read are much more concise and to the point. I just can’t seem to do that – short stories was always my worst module. I just have too much to say. I also get pretty deep and philosophical at times but I’m like that in general, always with the deep thoughts and getting lost in a little world of my own. I think I put a lot of myself into my blog, more than I ever thought I would. I know lots of you out there reading this personally, you’re my friends, family, my colleagues, friends of friends or friends of my brother. That said, knowing you bunch are reading my ramblings gives me the warm and fuzzies rather than the ‘aargh I have to delete everything and head for the hills – they know too much’ – though some of you probably wish I would at times! Quite frankly, I don’t have a choice. I’ve always done it. Paper journals, Live Journal, product reviews, Hubpages, I’ve always had some sort of outlet on and offline. I can’t help myself, I’m compelled to put pen to paper, fingers to keys. There is nothing quite as satisfactory as seeing a blank page covered in my words, my thoughts, my worlds, it’s like I’m looking at a little piece of what’s inside of me. I might not always like what I see but it’s better out than in. We used to get asked this question a lot at University, they called it a reflection. We had to explain and then justify why we had wrote something, how we went about creating it, what it meant to us and what we wanted it to mean to our audience. Why, why, why? It was one of the hardest questions to answer. When I write a creative piece, a short story say, or a script, I have no idea how or why it happened, it just did. How can I explain and justify something even I don’t understand? But I had to, so I did. What did I find between those lines? The story that I was really trying to tell. That’s why I write. When it comes to my blog, my writing process is pretty straight forward. I have a notebook dedicated to blogging. Every month gets its own page, and each day of that month has its own line on the page. Generally, I publish a blog post at 6pm GMT Monday, Wednesday and Thursday, so I go through each one of those and look around my room and through my diary. Got a meal at a new restaurant coming up? I pencil in the first available blog post slot after the meal for the review. Got an empty product or something I’ve been waiting to review? I pencil that into an available day. Just finished a book? You get the picture. The days fill up fast! Nothing is set in stone but I like to have a list of pre set titles and/or ideas to go off as I write around 90% of my blog posts roughly a week in advance. Scheduling posts in an absolute god send if you ask me! Without it, this blog would lack some serious consistency! 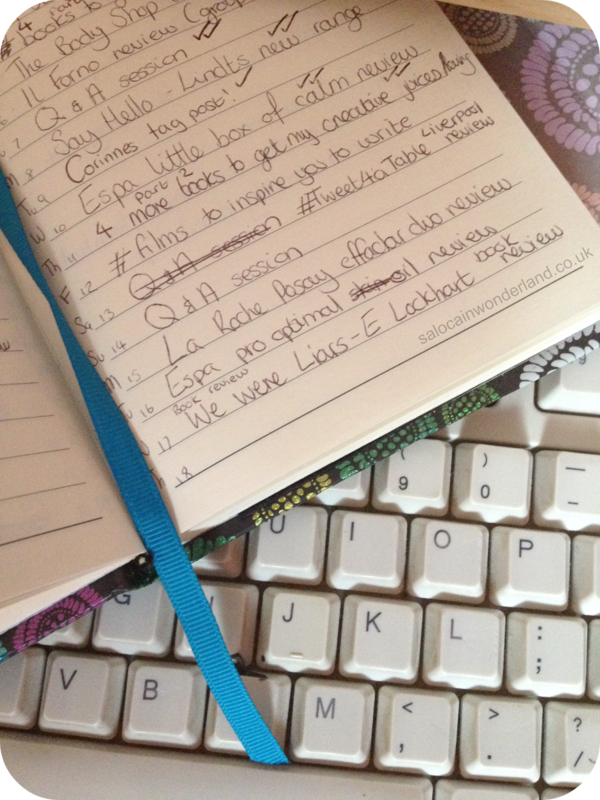 A lot of the time blog posts are moved around, crossed out, penciled in elsewhere or go completely ignored, but as someone who loves to work from a list, this system works wonders for me! I try to stick with a post until it’s finished, checked over, polished and has its pictures before I start the next one. I find if I leave a post half done it never gets finished! There you go folks, another little look into a crazy corner of my brain! Thanks to Corinne for tagging me, I’ve loved this one! I’ve been thinking about writing and writing so much lately it’s left me feeling more inspired than drained! I'm so glad you did this tag. Woo! I loved this tag! I love talking/writing about writing lol and I've loved reading others responses to it! Gives me lots of ideas! Blogging everyday usually terrifies me but this i the fist time I've not only been this excited about it but actually sticking to it, very proud of myself lol, the question is do I keep going for October? I had a hard time scheduling a posts because my brain is not functioning when it comes to posting ahead of time. I can’t think of anything to write about even if I already reviewed a product unless it’s the day to have my post published. I really enjoyed reading this and I wish you luck on your goal this September. I used to be the same but the more I got into blogging the more the ideas came to me and eventually I built up towards having a long list of things to bog about, so I could write up the posts in advance and finally start scheduling! Best thing ever for me!